Join us for the evening at Talking Spirits Cemetery Tours Candlelit Tours. On the 90-minute walking tour, local actors share Civil War stories through portrayals of Wisconsin soldiers and citizens buried at Forest Hill Cemetery. Sunday Tours leave every 20 minutes starting at 5:30 – 8:00 PM. Purchasing tickets online will allow you to book preferred time slots of tours. 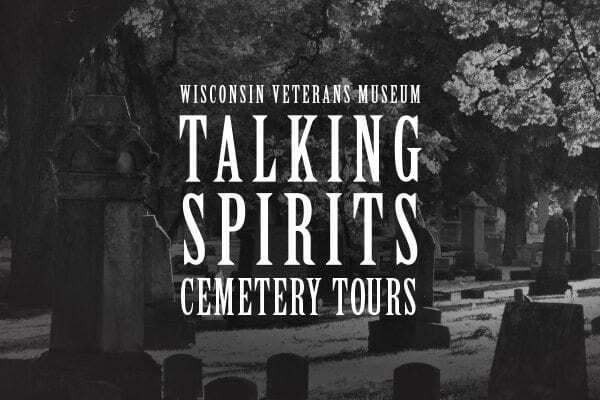 Held each fall at the beautiful Forest Hill Cemetery in Madison, this award-winning living history program illuminates the lives of many prominent and lesser known-figures in Wisconsin history. Tours will focus on the contributions of Wisconsin’s soldiers and citizens during the Civil War . Local actors and actresses don period dress, giving viewers a first-person encounter through scripted vignettes. Tour guides lead informative discussions of the cemetery’s rich history during the 90-minute walking tour.